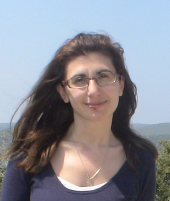 Sunday 12/4/2009: On Sunday 12th of April we started our road trip early in the morning from Xanthi. We crossed very easily the borders from Kipous, we left Kesan and about noon we were in Gallipoli. By ferry boat we were in Asia. Before noon we visited the ancient city of Troy and some hours later the ancient Greek city Assos that was founded by Aristotle and two of his students. In Assos there is an ancient temple of Athina. We did our first camp on our way to Ayvalic. Monday 13/4/2009: Early in the morning we were in the beautiful Ayvalik where someone can still see Greek orthodox churches and neighborhoods. In the afternoon we reached Izmirs University where our friends Ayse, Elgin and Elvan were waiting for us. Ayse offered us hospitality in her house where we spent the next three nights. Tuesday 14/4/2009: Next morning we visited the impressive university of Izmir EGE where our friends Elgin and Ayse work. Elgin conducted us in the city and we made a long walk to the beautiful and famous Izmir's seaside. In the evening I was invited by Izmir's mountaineering club IDADIK where i did a presentation of my mountaineering activity and also of the movie from the last expedition in Pakistan in 2007. Many mountaineers were in the presentation and at the end IDADIK gave me many presents and flowers. By the end of the presentation we, all together had some drinks to a bar. Wednesday 15/4/2009: Next day was a relaxing day with many walks in the city. In the evening our friends prepared a great dinner for us in Elvan's house which is unforgettable for us. Thursday 16/4/2009: We woke up early in the morning and said goodbye to Izmir. What we will never forget is the love and the hospitality of our friends there. Our next stop was the ancient city of Ephesus where we visited the famous Library. Early in the afternoon we were in Pamukale a natural wonder famous for the hot, calcium - rich waters. We also visited the ancient Roman city of Hierapolis. We drove until the sun went down and did our camp on our way to Cappadocia. Friday 17/4/2009: After lot of time of driving through nice areas in the afternoon we were in Kayseri to our friends Nurettin and Aglika. Saturday 18/4/2009: In the morning Agi conducted us in Kayseri. It was the coldest day of our trip and we could see the slopes around with snow. 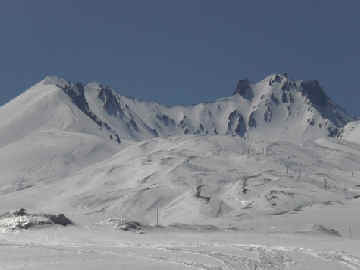 In the afternoon me and Thalia went to the ski center of Erciyes. There I informed the army (Jadarma) for my next day climbing effort, they wanted to know what time i would go and also what time i would be back. Then i went up to the upper side of the ski pistes to check the snow condition. The snow condition seemed good so I went back to the ski center where Thalia was waiting for me. At about 19:00 we were back home in Kayseri to prepare myself for the climbing. Sunday 19/4/2009: I woke up very early at 2:50 and by 3:40 i was already in the ski center, where I visit Jadarma (the army camp) to inform them for my departure to the mountain. At 3:50 I start trekking fast into the ski piste. I was in the upper side of ski center with the sunrise. It was very cold with a strong north wind. I follow the normal route from the east ridge of the volcano's crater. Close to the ridge, slopes get steeper and the snow was hard, such crampons was needed. The wind made my climbing more difficult. 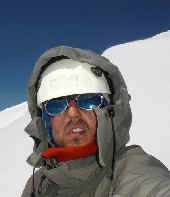 I short time I reach the altitude of 3500 meters on the ridge. From here the summit looks like very close, but the snow was fresh and was up to my knee deep even deeper. Trek was very hard and I was going very slowly. Ridge was always up and down and too long. I thought to stop and return due to deep fresh snow. Finally I continue, since I had still time. The ridge is cut by the huge rock tower named "Camel's Hump", which I traverse from the right. The slopes here were steeper up to 40 degrees. Also, the snow condition was bad, and the altitude makes me headache. I climb slower, making stops every ten meters. Although, I finally reach the summit at 11:25. Because snow was fresh, I couldn't climb to the actual rocky summit, which was covered by fresh snow. I stood 10 meters lower, where the most people stay. The view from the summit was perfect, many mountains far around me like Aladaglar and Hasan and many other to the east. I stay from half an hour on the summit enjoying the beautiful view, looking half Turkey. Afterwards, I start to descent fast, but the ridge has many parts with ascents. Reaching the last hill on the ridge I fill happy because route now was easier. Altitude was lower and I fill much better. At 14:25 I reach the base of ski center. The route was about 18Km with about 1900 meters of total ascent and It take me 10 and half hours. Early in the afternoon I was back in Nurettin's house in Kayseri where we had dinner with two friends of Nurettin. 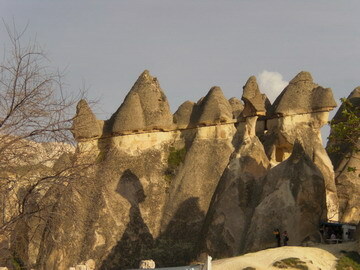 Monday 20/4/2009: In the morning we reached Goreme in the Cappadocia. The town is centered in the middle of an internationally popular region that is best known for its natural rock formations often called ''fairy chimneys'' rocks cut naturally by the wind and rain. We visited the open air museum that has many orthodox churches that are in the rocks. We walked for many hours in the valleys where the view of the rocks is unique. We did our camp very close to the red valley. Tuesday 21/4/2009: We woke very early in the morning because of the dozens of the balloons that almost covered the whole sky over Goreme. It was a magnificent spectacle. We visited the city of Saint Procopius (Urgup) and after that the Underground City of Kaymakli. We spent the night in a hotel that is built in the rock. Wednesday 22/4/2009: After a filing breakfast and a long walk we left from Goreme and drove many hours to Ankara. We did a nice walk in the city and after that we had a rest in the hotel. Friday 24/4/2009: The last day of our road trip we spend a few hours in Edirne and then we crossed the borders to Greece. We visited my cousin Constantine in Orestiada and we were back in Xanthi at about 19:00.